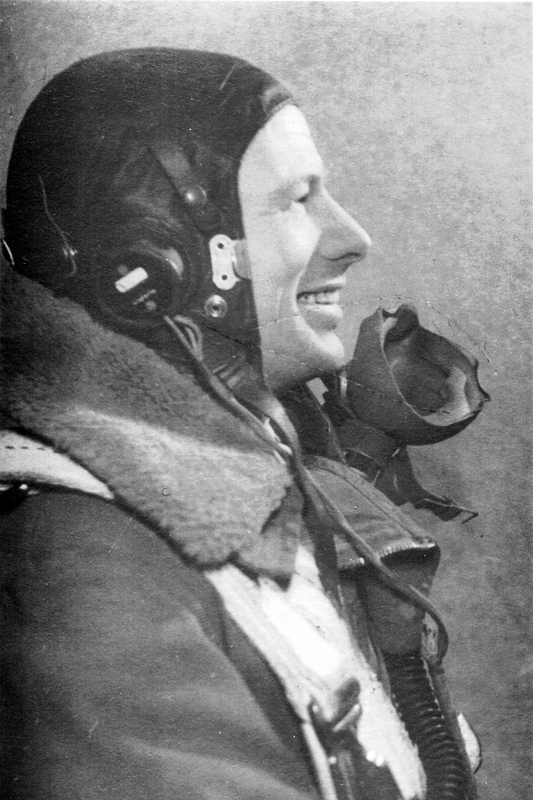 “Russ” Russell, Bombing Leader at 75 (NZ) Squadron, Mepal, 1944 – 45. – photo from “Dying For Democracy”, by Flt Lt G A Russell DFC. Many thanks to Chris for providing another perspective on the events of the 13th/ 14th February 1945 Dresden Op……. My uncle Gerry Newey flew as Wireless Operator with Johnny Wood and Doug Williamson in JN-Dog, the lead aircraft on that Dresden op’ 70 years ago. Neither his logbook nor diary give any hint as to the significance of the raid, but they convey the satisfaction of seeing a job well done, and perhaps some degree of elation at witnessing and being part of such an awe-inspiring event. “Did a D.I. on Dog & waited in the mess all morning. Had briefing & took off at 2150 for Dresden. The crews were briefed before each op’, and there is no question – this op’ was presented as a military target, just another in a long line of targets in or nearby major cities. The briefing that day is remembered by 75 (NZ) Squadron’s Bombing Leader, Flight Lieutenant Alan “Russ” Russell, DFC, in his book, “Dying For Democracy”. “The participating air crews were briefed by the Squadron Commander, the Navigation Leader, the Gunnery Leader, the Wireless Leader, and the Intelligence Officer, who always made interesting remarks about each target. On this occasion he mentioned that Dresden was the central base for the whole of Germany’s very extensive variety of communication systems, especially the telephone. This included both telegraphy and radio, none of which had so far been damaged. Consequently Hitler’s leaders in all of his war fronts were being kept fully informed of what was daily required of them. The weather man for the Squadron advised the crews about the weather we would have to confront and pass through. Finally, as Bombing Leader, I gave the crews the details of their bomb loads. Always at briefings there would be a large area map illustrating the intended target. Dresden was a very big German city, only a few miles from the Russian border. Six hours before our briefing, an unarmed, lively, Mosquito twin-engined reconnaissance aircraft flew over the target area and obtained many photographs which, during the briefing, were projected onto a large screen for the bomber crews to see. The wide expanse of the city included extensive railway marshalling yards, with many railway wagons already connected into long trains. One particularly clear shot was of a very long line of flat-topped railway wagons with each wagon supporting a military tank. Many of the long lines were of closed freight wagons. We could see no railway coaches suitable for troop movement. Intelligence however, stated that there were masses of armed troops billeted both within and near the city. 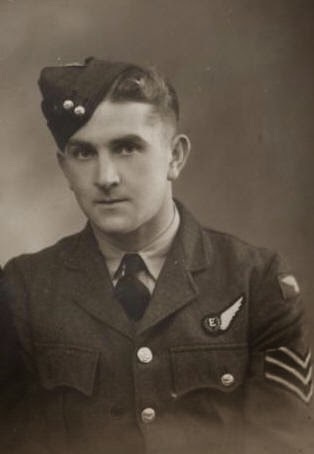 Not only did Russell brief the crews before they left, he actually flew on the Dresden op’, as a fill-in Bomb Aimer for his old 218 Squadron Skipper, F/L Don Thomson, who had since been posted to 75 (NZ) Squadron. 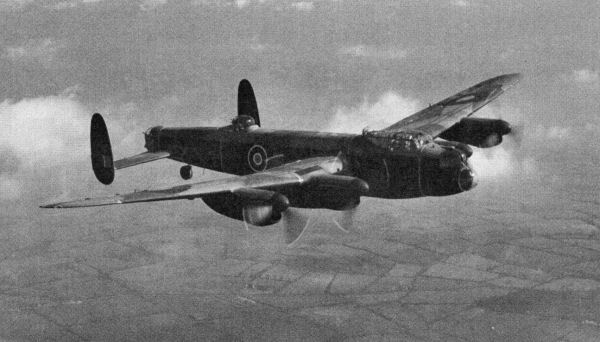 (Note that the Form 541 lists F/S Hilray Hubert Stratford, Thomson’s usual Bomb Aimer, as flying this op’). Flight No 36. Dresden. Germany. 13/2/1945. Load carried. 1 x 4,000 lb HC, 3 x 750. No 15 cluster of 4 lb incendiaries, 1 x 500. No 17 cluster of 4 lb incendiaries and 1 x 350 lb Munroe container of information leaflets, all printed in German. Time airborne. 9 hours exactly. Don Thomson and his crew, loaded up and ready to go. – photo from Dying For Democracy, by Flt Lt G A Russell DFC. 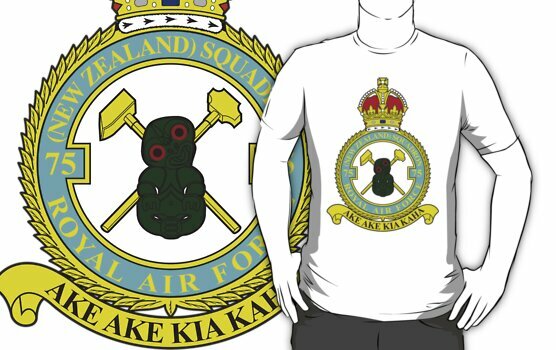 Russell recalls that the initial Pathfinder Force Target Markers found that the target was covered in 10/10ths cloud, and they had to use the “Wanganui” marking method, which combined unquenchable flares dropped on the ground with parachute flares dropped from high above. The Master Bomber would direct the bomber stream by advising which coloured sky flares were closest to the ground flares, the glow of which was hopefully visible through the cloud. “In my case, I was really impressed, because as I sighted on a floating flare in the sky, at the moment of releasing my bombs, the dimming, yet still faintly visible unquenchable flare on the ground, lined up perfectly in my sight. Wonders never cease! Russell doesn’t expand on the logic of combining incendiaries and paper leaflets in the same bomb load!! 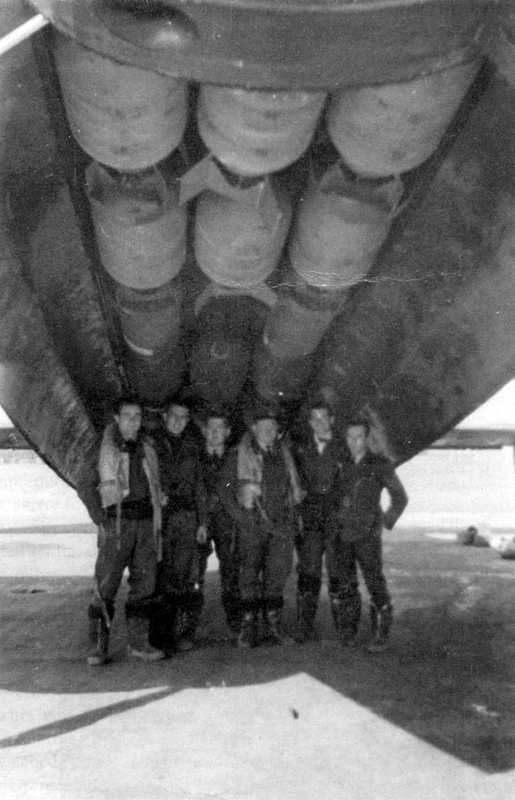 Bomber Command’s crews were driven relentlessly, “night after night”, to attack targets that were chosen for maximum impact on the German military effort, to help shorten the war. As Russell argues, the men did not have the luxury of political or moral perspective on individual operations, they had a job to do. They weren’t privy to the overall strategies behind the choice of targets and methods employed, but if they were to work, it was critical that each individual played his part as instructed. Reference, “Dying For Democracy”, by Flt Lt G A Russell DFC, 1997, self-published (Russell), Wanganui, NZ. This entry was posted in general and tagged 13th February 1945 Dresden, 1945, 75(NZ) Squadron RAF, Albert John Tipping Cash, Aviation, Bomber Command, C. Payne, D. Brazier, Donald Winter Thomson, Douglas Williamson, Dresden, Gerald Newey, Grant Alan 'Russ' Russell*, Herbert Ronald Holliday, HK601 JN-D, J. Messer, Jack Heaton, John Austin White Pauling, John Henry Thomas Wood, Mepal, Noel Ridley Hooper, Operation Thunderclap, PB820 JN-V, Ralph Charles Sparrow, World War 2 on February 15, 2015 by 75nzsquadron.